Here comes the battle of the super affordable flagship killers! A few years back, OnePlus made waves by launching a phone that came with flagship specs at half the price of typical flagship phones. Unfortunately, their phones have become more expensive through the years, which has opened the door for other brands to take the budget flagship crown. Now two brands are vying to replicate OnePlus’ success: Honor with the Honor Play, and Xiaomi’s Pocophone sub-brand with the Pocophone F1. While both offer flagship processors, the Pocophone F1’s Snapdragon 845 processor has more muscle compared to the Honor Play’s Kirin 970 processor. In addition, the Pocophone F1 has a higher base RAM at 6GB compared to the Honor Play’s 4GB RAM. As of this writing, the Honor Play is only offered in a 4GB/64GB variant in the Philippines, while the Pocophone F1 will be offered in the Philippines in either 6GB/64GB and 6GB/128GB variations. Not counting the Armored edition of the Pocophone F1, the Honor Play offers a better build with its slender-yet-solid aluminum unibody. The Pocophone F1’s polycarbonate may look generic and cheap, but its overall build is nonetheless solid and ergonomically sound. Aside from having more screen estate, the Honor Play uses a better display compared to the Pocophone F1. However, the Pocophone F1 gets a few plus points by using Gorilla Glass protection. In addition, the Honor Play has a smaller notch, though the large notch on the Pocophone F1 is justified because of its additional infrared sensor for its face unlock feature. While the Pocophone F1’s primary rear camera has fewer megapixels compared to the Honor Play, it boasts of a brighter aperture opening, along with Dual Pixel Autofocus. The Pocophone F1’s depth-sensing camera has a higher 5-megapixel resolution compared to the Honor Play’s 2-megapixel sensor, and the same goes for the front camera. On paper, the Pocophone F1 has better cameras, but we have to do our usual tests to see if they deliver. As value-for-money flagship killers, both the Pocophone F1 and Honor Play don’t scrimp in offering additional features. Both phones come with HiFi audio, fingerprint scanner, face unlock, USB-C, and quick charging, and they have their respective performance-enhancing tech: the Honor Play has GPU Turbo, while the Pocophone F1 has a LiquidCool cooling system. While both phones have 18W quick charging, the Pocophone F1 has the advantage of having a bigger 4000mAh battery. On our review of the Honor Play, we got a score of around 10 hours on PCMark’s battery test, and we expect the Pocophone F1 to have a better battery life with its bigger battery. If raw power is the basis, the Pocophone F1 certainly offers better value for money compared to the Honor Play with a higher RAM, bigger battery, and more powerful processor. 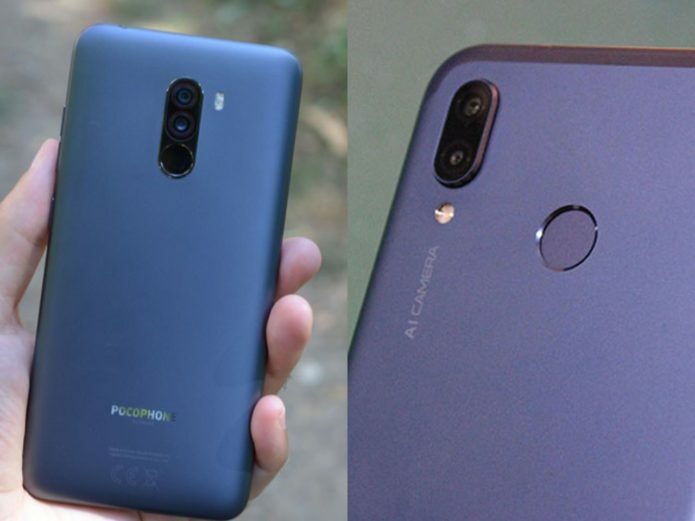 However, to offer such beastly specs, the Pocophone F1 had to compromise on the build by using a polycarbonate shell and rather generic looks—unless you choose to get the Kevlar-equipped Armored edition (which will not be sold in the Philippines as of this writing). While we cannot vouch for the Pocophone F1’s durability, aluminum is generally more durable than polycarbonate. Not to mention, the Honor Play’s looks is more stylish compared to the Pocophone F1. As for the price, the Pocophone F1 is Php 2k/$38 more expensive than the Honor Play at Php 17,990/$337 for the 6GB/64GB variant. However, it gives you more RAM, a more powerful processor, better cameras, and a bigger battery to boot compared to the Honor Play. In both cases, the Honor Play and Pocophone F1 are priced aggressively and are set to rule the mid-range segment.